You might recall that my recent attempt to grow my own oyster mushrooms fizzled out when my promising crop suddenly dried out. Since the kit I was using had two growing compartments, I set it aside to try again later and instead purchased some mushrooms to use in a pasta dish. Last week, when I was tidying the kitchen I moved the kit to a little-used area of the countertop with the used side against the wall. Today, as I was working at the sink, I caught a flash of white in my peripheral vision. To my astonishment, it was a very large oyster mushroom growing around the side of the box and against the wall. I was eating on my own this evening, and decided to turn my solitary mushroom into dinner. 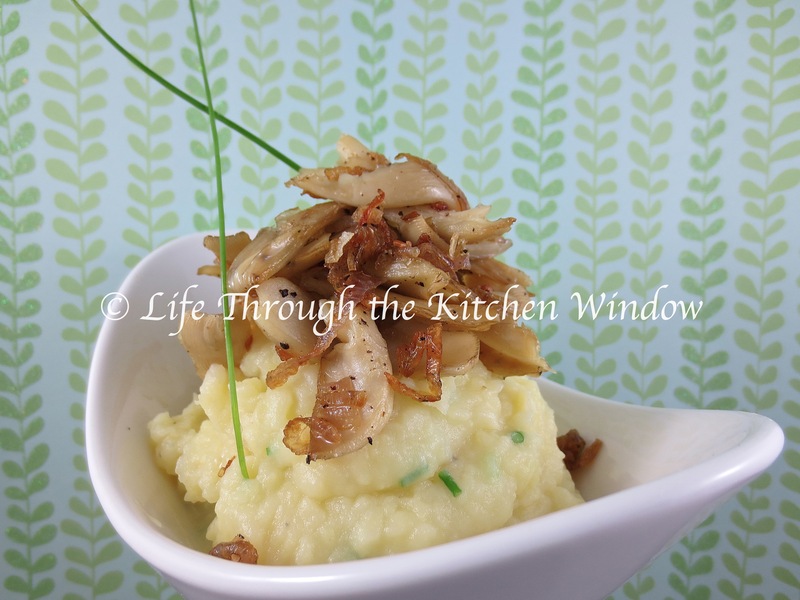 And what a meal it was: creamy mashed potatoes enlivened with green flecks of chives from the garden, topped with butter-sautéed oyster mushroom accompanied by golden brown, almost crispy slices of shallot. This was the first time I’d had oyster mushrooms, and I savoured every bite. The flavour was a bit more intense than the cremini mushrooms I used in my previous recipe, but it was the texture that really caught my attention; firm and meaty, these delicate-looking mushrooms were actually quite hearty. While this dish served as my entire dinner, I absolutely would serve it for guests alongside grilled steak or roast beef with some brightly coloured vegetables on the side. A dish fit for company that made my dinner for one feel like a special occasion. Place the potatoes in a small pot and cover with cold water. Put the lid on and bring to a boil. Turn the heat down to a rolling simmer and cook until the potatoes are tender. Drain and return the pot to the still hot burner for a moment to evaporate any water that’s left. Add the milk and butter, cover and let sit for a minute or two so the butter melts. Mash until the potato is smooth and creamy. Season with the salt and pepper to taste, and stir in the chives. Cover and set aside. In a small skillet over medium heat, melt the butter and add the garlic and shallot. Once the butter foams up, turn the heat to simmer and cook until the shallot is beginning to brown. Remove the garlic from the pan, then add the strips of oyster mushroom, the salt and freshly ground pepper. Turn the heat up to low and sautée for about five minutes, until the mushrooms are beginning to soften and the shallot slices are browning but not yet crispy. Taste and adjust the seasoning as required. 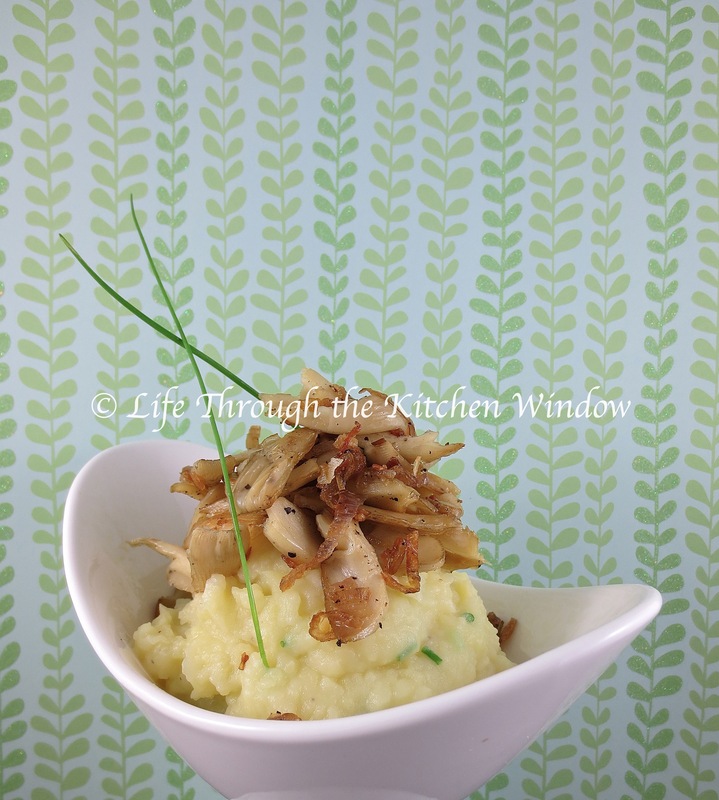 To plate, spoon the potatoes into a mound and top with the oyster mushroom and shallots. Garnish with a couple of spears of chives. This looks amazing and your story inspiring. Good luck, Rhonda! I was sure surprised to see that mushroom, and one went a long way too. I have the other side of the kit soaking in water now. I wonder what I’ll get this time! A great choice for using your shrooms! Yum! Beautiful photos and meal Mar. Excellent! Thanks so much, Shannon. The kit supplied by Mushrooms Canada has really gotten me thinking about mushrooms in a new way. So hearty – I realized after I’d published my post that it was ‘Meatless Monday’ and my dinner qualified! You sure did put you new-found mushroom wealth to good use. 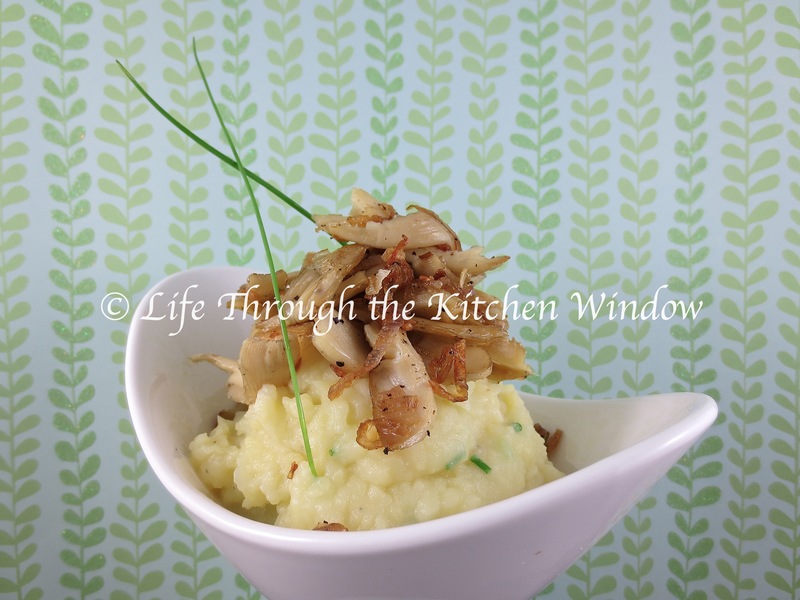 I bet the mushroom-shallot “topping” gave those mashed potatoes a great deal of flavor. Do you think you’ll give mushroom growing another try or have you moved on? Actually, I just started the other side of the kit yesterday. I’m hoping it cooperates and I can enjoy another mushroom meal next week. After, I’ll probably just buy my mushrooms at the market like everybody else (well, except for those mushroom farmers who I’m sure work very hard and don’t neglect their crops!). Neglect and look what you got. 🙂 That is the prettiest dish of mashed potatoes I’ve seen. Thanks, Karen. It’s fun to take a humble ingredient and present it with some pizzazz.